Savvy Spending: Michigan Activity Pass (MAP) Program-- gain FREE access to hundreds of parks, museums, and more with your library card! Michigan Activity Pass (MAP) Program-- gain FREE access to hundreds of parks, museums, and more with your library card! Want to plan some fun things to do this summer? Check this out! If you're a Michigan Resident and are looking for a FREE way to gain access to hundreds of state parks, campgrounds, museums and activities, you need to make yourself familiar with the MAP Program! Have you heard of the Michigan Activity Pass (MAP) program? Perhaps you've noticed this program at your local library, but didn't really know what it was. The Michigan Activity Pass gives Michigan library cardholders FREE access to 385 sites and numerous events. Plus, the program is now ALL ONLINE! 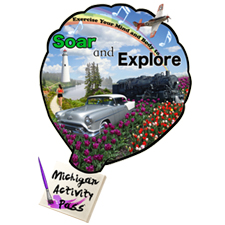 So just visit the Michigan Activity Pass website to find all the activities available! Passes are valid for use for 1 week. This is a great way to visit state parks, museums, and more... for FREE!